I just purchased some HC-05 Bluetooth devices and I have followed the directions to put the devices in AT command mode by holding EN HIGH when the HC-05 powers up. When I do this the HC-05 goes into the "slow blink" to indicate it is in command mode. However, when I send it "AT" I get odd characters in the response. Note that when I type "AT" I get exactly 4 characters back. They are just not the "OK" characters I expect. I also verified that the Arduino IDE serial console is sending both NL and CR characters. It has been suggested that the data from the HC-05 is only going up to 3.3v and that might be the cause of the problem, since the Arduino is looking for a 0-5 volt signal. I also note that when I remove the TDX line from the HC-05 that no responses come back. So I suspect that it is getting the "AT" fine through the RTX from the Arduino to the HC-05. It is just some problem in the return data format. Is there a simple transistor circuit I can hookup to shift the levels back to 0 to 5 volts from the 0 to 3.3 volts? I am also using an Arduino Nano if that makes any difference. I believe there is something to do with the speed of switching between high and low and getting crisp rise and falls of the signal. 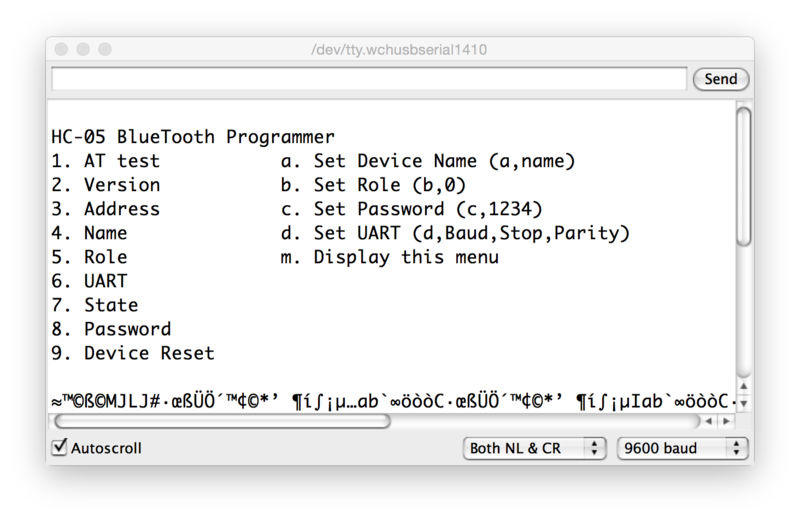 If you use software serial for Bluetooth, you need to set the baud rate and the default baud rate of HC-05 is 38400. You can change this baud to the desired with AT command. Set Baud rate to 38400 in serial monitor. If you have Arduino UNO with removable Atmega328p - then remove the chip and connect TX of HC05 to TX of Arduino and RX to RX. Most of the HC05 works perfectly with 5V system (I have one here hooked up to 5V and RX,TX connected directly ( without level shifter) but it's not recommended. If you are indeed receiving something after the AT command, that means you have the baudrate wrong. Change it from the serial monitor to 38400 or something else. BAUD rate varies so try them all. Some expect a question mark after the command and some don't e.g AT? Some require CR and some don't. Some only stay in AT mode for a second on boot and thus I found I had to set it up in steps, e.g write program to set PIN, then another to set NAME and so on..
Reason for this is that many clones do not have full software and commands installed. Try setting your baud at 38400. Connect Tx->Tx & Rx->Rx when configuring your module. Tx->Rx & Rx->Tx during execution. Not the answer you're looking for? Browse other questions tagged serial bluetooth arduino-nano voltage-level hc-05 or ask your own question.